2 Dual-Heatpipes for optimal heat absorption - Using 2 u-shaped Dual-Heat-Pipes, the NC-U6 has sufficient capacity to reliably dissipate even the heat generated by overclocked high-end chipsets. 29 Aluminum cooling fins for optimal heat dissipation - Thanks to a surface area of more than 500cm², the cooling fins dissipate the heat extremely fast - without the need of an additional fan! 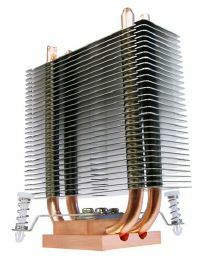 Soldered joints for optimal heat-transfer - Unlike many other coolers, whose heat pipes are stuck to the base and the fins, the NC-U6 possesses high-grade soldered joints to ensure optimal heat transfer. Easy installation on Intel and AMD mainboards - The NC-U6 comes with mounting parts for Intel and AMD mainboards and uses the existing fastening hooks or push-pin mounting holes.